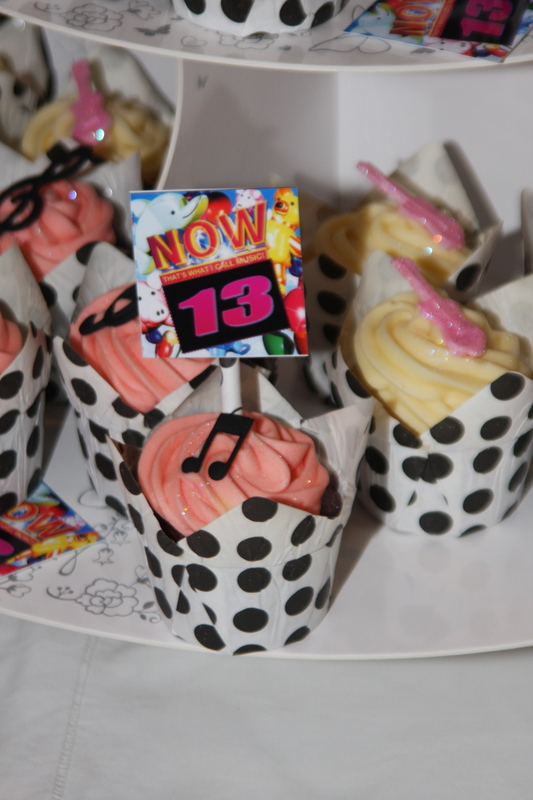 The challenge last weekend was to make Disco Party cupcakes for Nicole who was turning 13. Given free reign I chose music notes and pink guitars for the cupcakes and added a Now 13 cupcake topper on some of the cupcakes (thanks to my son Teigh I always have help for anything I need to do on the computer – how is it that our kids really do know more than us when it comes to electronics?). I sourced a beautiful stand (a wedding cupcake stand) from In Good Company in Rivonia and then stacked the 40 cupcakes on it finishing it off with a Now 13 CD cover on the top. 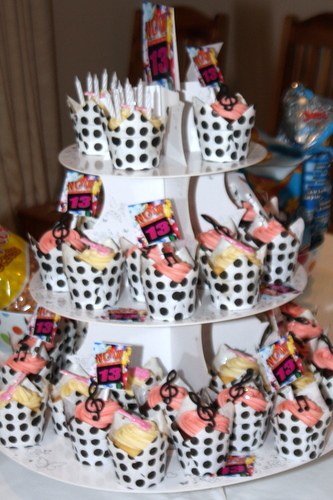 It looked really cool on the party table and it was fun to see the kids going home with a cupcake each. All of these cupcakes look stunning. But how do they taste? Well, since I have asked Lisa to make cupcakes for several special occasions, I can honestly say that they taste absolutely devine. My personal favourites are coffee, chocolate and orange. Lisa demonstrates how passionate she is in the way she takes so much care, from the time she takes an order to transportation and delivery of the little cakes (sometimes not so little). She is ever so thoughtful and professional. Can’t wait to taste new flavours and to see the delightful decorations that this very creative lady comes up with. Thank you Michelle, it is friends like you that give me more and more confidence with everything I do. You have given me so much inspiration.